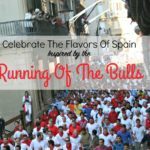 A few years ago, my husband and I checked off one of our bucket list travel experiences and went to Pamplona, Spain for the annual Running of the Bulls Fiesta of San Fermin. 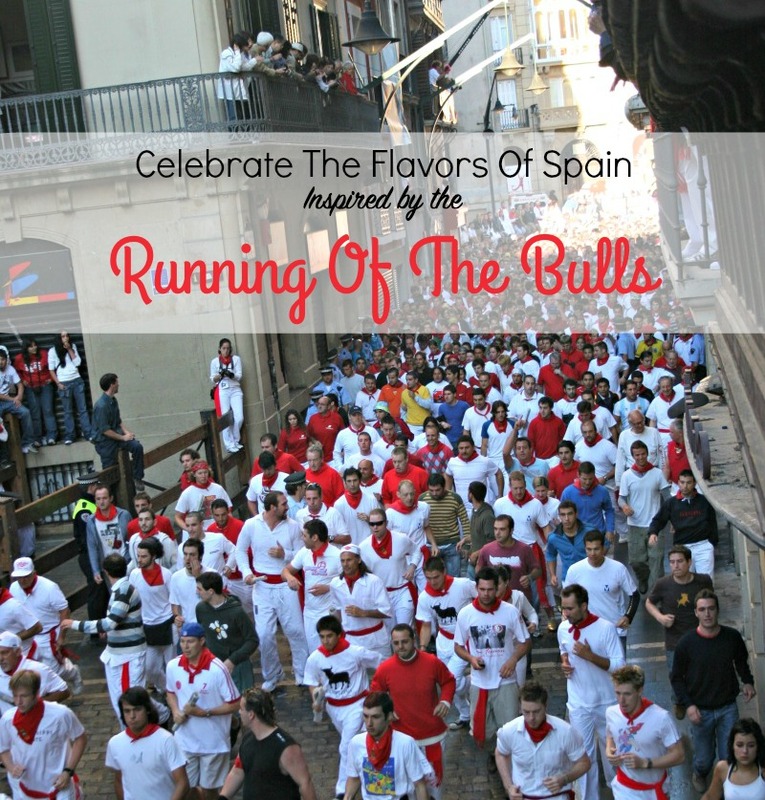 The Running of the Bulls takes place every year from the 6th to the 14th of July. It was absolutely one of the highlight trips of my life. 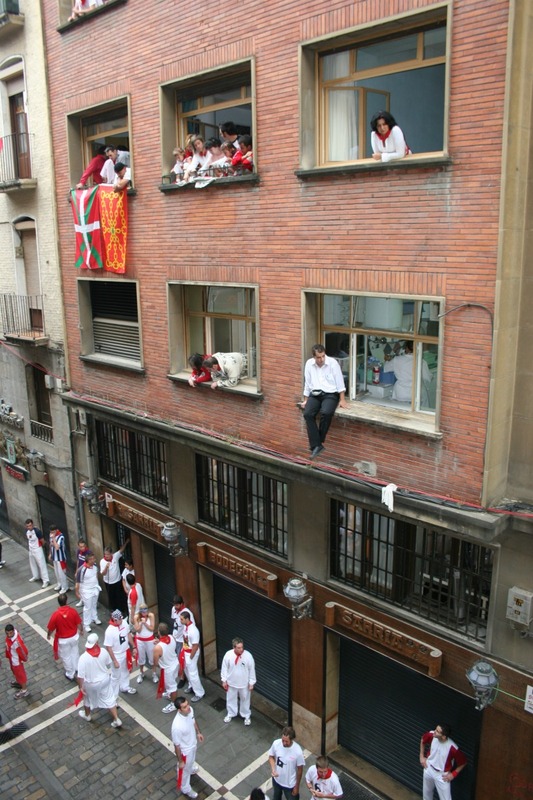 The entire town of Pamplona is absolutely electric with thousands there to be a part of this fiesta in honor of San Fermin, the patron saint of Navarra. 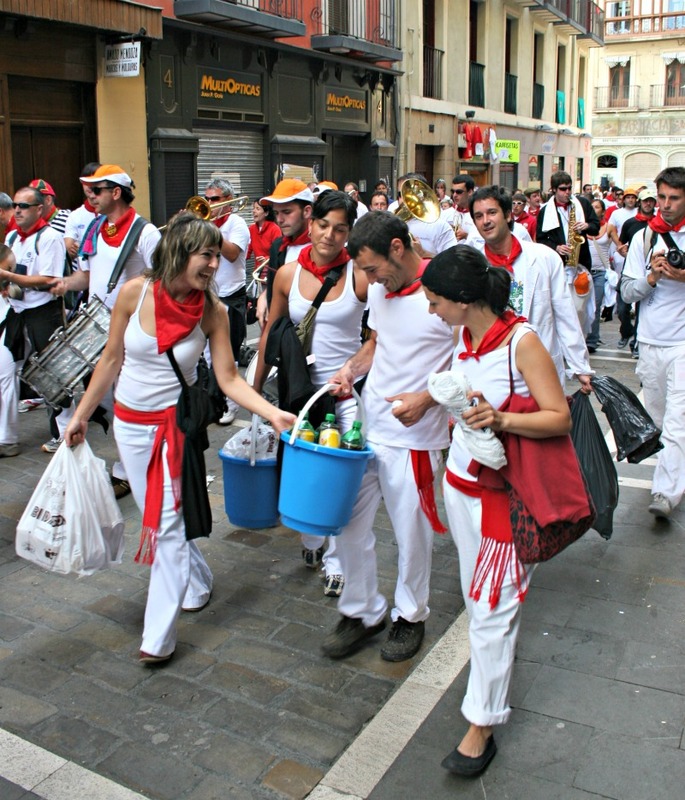 Of course, the biggest draw, is The Encierro– The running of the bulls. 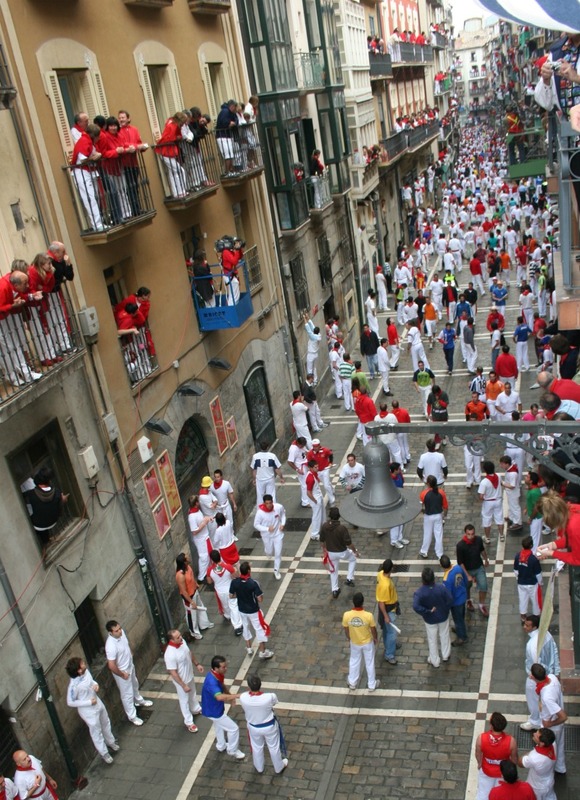 We stayed in Pamplona for three days, and the first day, I would say we spent getting ourselves accustomed to our environment. Of course we had to pick up some red scarves to compliment our white outfits. 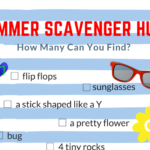 Because everyone, everyone- is wearing white and red. 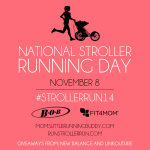 On the second day, my husband decided he was going to run. (I know, he’s insane.) We also rented a balcony (a must-do if you go) and while I waited on the balcony above where the run would take place, he went to go line up. The bulls are released every morning at 8am. Hey guy on ledge: I’m not sure that’s a very safe way to sit. The actual running happened so fast, I almost missed it! My husband said that it was like all of a sudden, the bulls were just right there and then they sped on by, with people just jumping out of the way. Crazy. 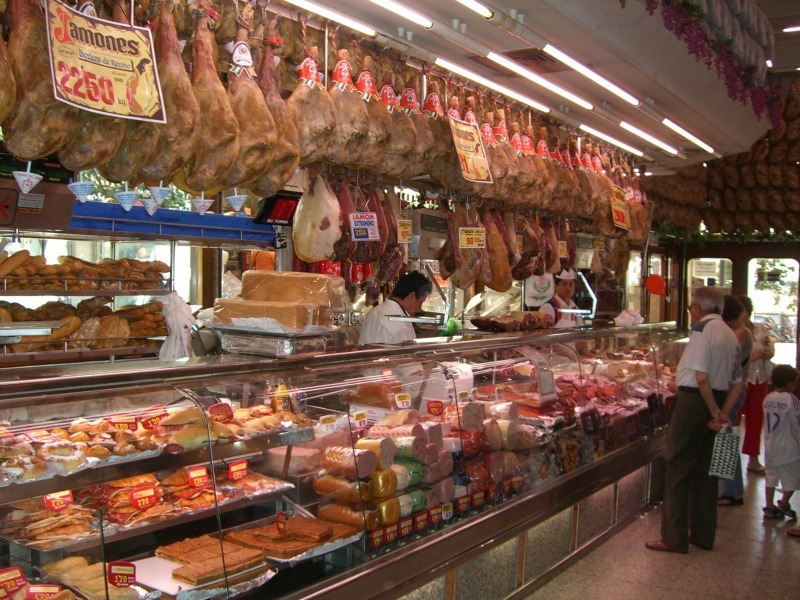 With the Festival of San Fermin just a few weeks away, I got a little nostalgic for our trip and of course, all those amazing wines and Spanish meats and cheeses. 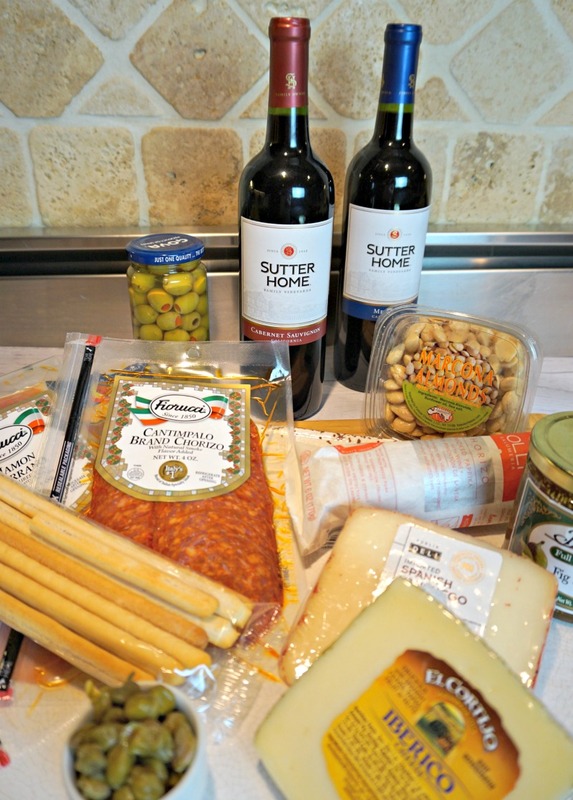 So I decided to head over to the store and pick up some Spanish olives, cheeses, meats, and of course, a bottle of Sutter Home Merlot and a bottle of Sutter Home Cabernet Sauvignon to complement my Running of The Bulls inspired Spanish cheese plate. 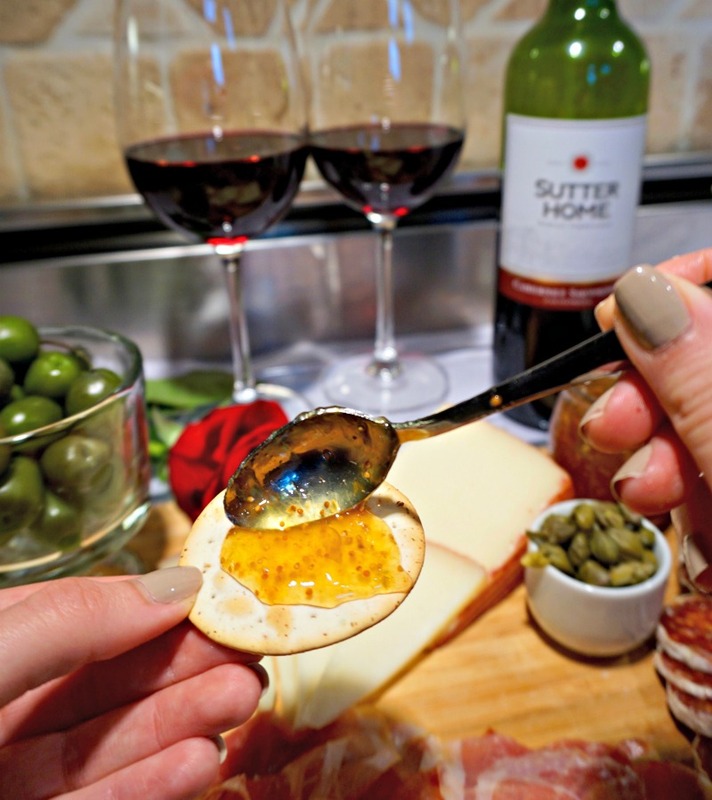 Sutter Home wines are the perfect go-to wine for all sorts of summer time celebrations. 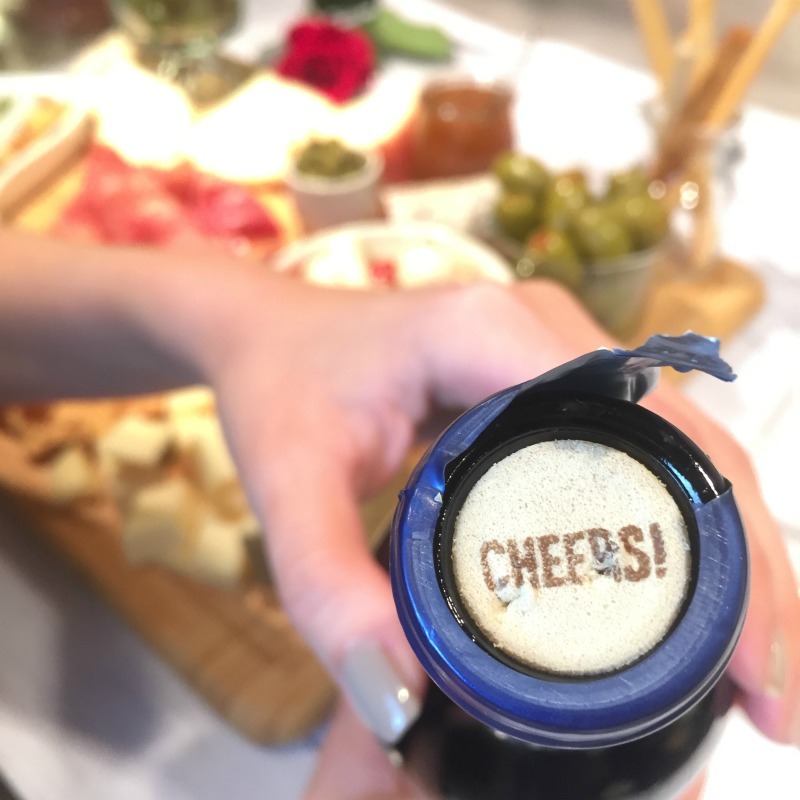 The award-winning California winery has so many varietals at such affordable prices, you can always find the perfect wine for everyone and every occasion. Here’s some of the goodies I picked up: Marcona Almonds (if you’ve never tried Marcona Almonds, they are native to Spain and have an almost “wet” texture), Spanish Chorizo, Serrano Jamón (ham), and finally some Spanish Manchego and Iberico cheeses. Of course, some breadsticks, crackers, fig preserves and Spanish capers. Even the Sutter Home cork knows how to have a party! 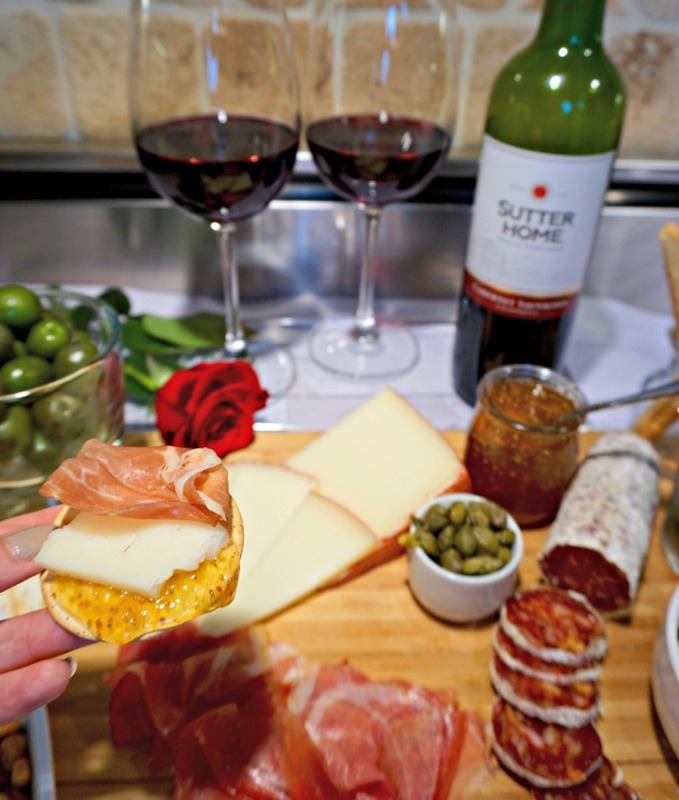 Try topping a cracker first with a tiny bit of fig preserves, a slice of manchego cheese, and top with Serrano ham. Delicious! Look how amazing it came out! Olé! Red Wines: It’s best to have a couple different wines for guests who might prefer fruiter or stronger wines. 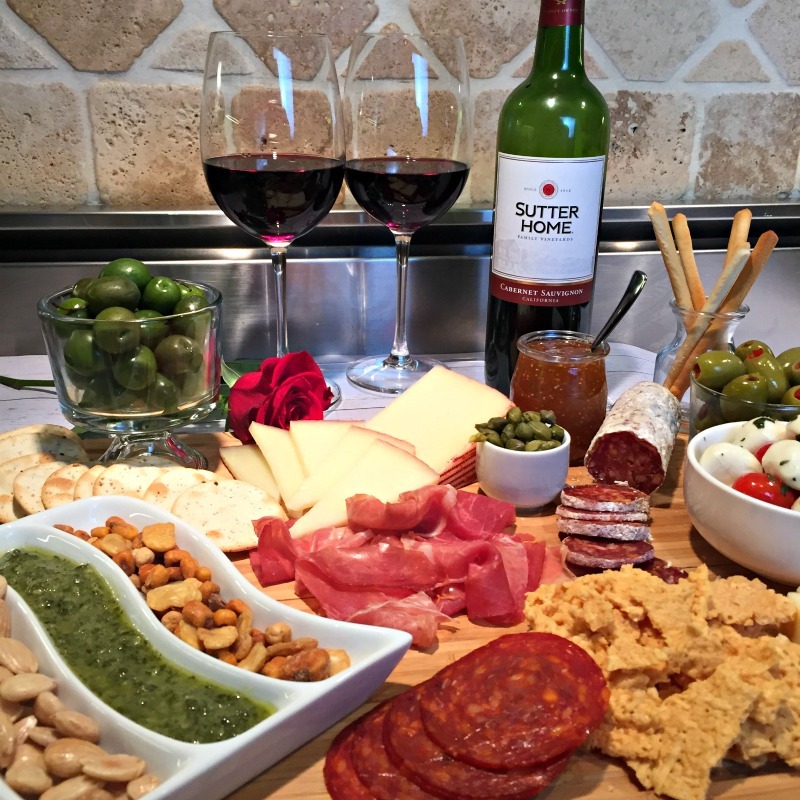 Sutter Home Merlot, Sutter Home Cabernet Sauvignon and of course Sutter Home Sangria pair very well with the flavors in Spanish meats and cheeses. Simply surround the cheeses with the other ingredients, try to strategically place items where they can add pops of color to your platter, for example: White cheeses looks even more appetizing surrounded by red chorizo and green olive pesto vs all-white cheese sitting together. 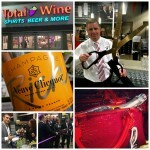 Uncork your wines prior to guests arriving. 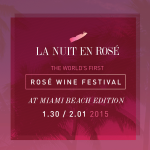 This gives the wines a chance to “air” and better develop their flavors. Would you ever run with the bulls? 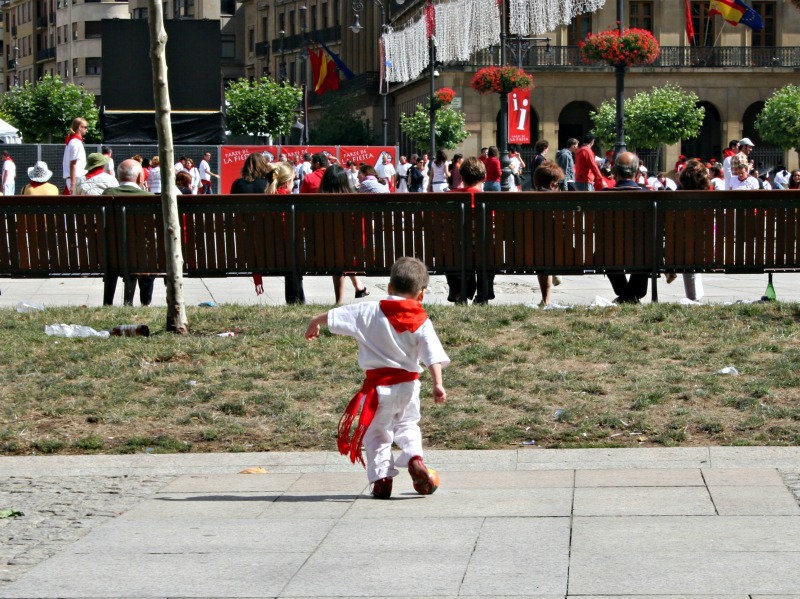 Have you been to Pamplona for the Festival of San Fermin?